The Hierarchy of Needs Model tries to explain human motivation and behaviour. The model theorises that people are motivated and driven by some general needs that are sought satisfied. Abraham Maslow assumed that all humans have emotions, desires, needs, and wants. To get what we need and want we must act, therefore humans will be motivated to take actions that will satisfy requirements and desires. By examining the needs of a respective employee etc., managers may use this information to stimulate his or her employee. It is theorised that these human needs can coexist, especially the top needs, and that humans may have several requirements at the same time. However, Abraham Maslow argues that the lower needs, such as physiological needs, must be met before humans will strive for the satisfaction of other obligations in life. These needs are essential requirements for survival, e.g., food, water and shelter. The needs for safety could be general safety and security of home and family, order and stability of the surrounding environment. This need concerns the human need for social belongingness and social needs. Requirements in this category could be love, affection and a sense of belonging to groups. Esteem needs could be a desire for reputation and prestige, social status, fame and glory, dominance, recognition, attention, importance, dignity, or appreciation. Humans will, therefore, be motivated to get these needs covered, which will potentially motivate them in, e.g. a job context. When all other requirements are satisfied, humans will potentially pursue self-actualisation needs. This need is the highest of all needs and is seen as the final stage of human need accomplishment. 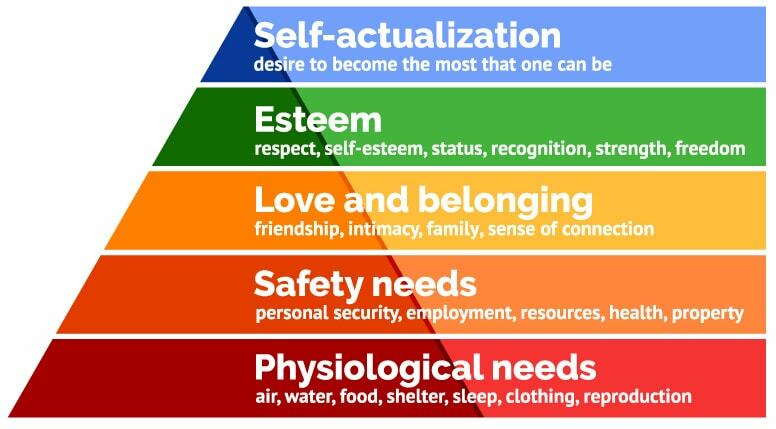 The Hierarchy of Needs Model is a standard tool to diagnose human motivation, but it may not generally apply to a non-western mindset. People coming from other parts of the world may not be motivated by the same factors, or may not have the same need for, e.g. esteem or self-actualisation. This problem is elaborated by Nevis (1983), who conducted an analysis of the Chinese workforce. This analysis concluded that Chinese people may have a different hierarchy of needs than most Western and American employees. This hierarchy of needs is often used to describe employee satisfaction and motivation, but it can potentially also describe motivational factors within consumer purchase processes.